HIRA needs to inform island voters quickly about the very dangerous track record of endless, dangerous demands made by radical LGBT activists in other states in the immediate aftermath of the legalization of homosexual ‘marriage’. After Massachusetts adopted homosexual marriage through a court ruling ten years ago, their public schools started teaching kindergarteners and elementary school children about the gay and lesbian lifestyle while clearly letting parents know that they had no say and no choice in the matter. And that’s just the tip of the iceberg. Hawaii residents have to know what will happen if they let liberal Hawaii Democrats redefine marriage. Virtually every single aspect of life in Hawaii will be forcibly affected; from your family’s employment to education to healthcare, the media, Hawaii culture and much, much more. Help HIRA to reach everyone before it’s too late. Help us keep our ads on the air! Please donate $10, $20, $100 or $1,000 today at http://www.HawaiiRepublicanAssembly.com. 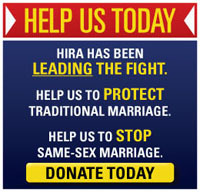 You can help keep these ads and messages like this on the air by contributing to HIRA’s SuperPAC “HIRA Action”. Even the leadership of the Hawaii Republican Party has explicitly told island Republicans that “folks should join HIRA if they care about issues”. Well, we completely agree and that is why we always need to be ready to fight back. Please join us. And please kokua by supporting traditional values and traditional marriage today by supporting HIRA’s outreach efforts with your donation to our new SuperPAC: HIRA Action. P.S. 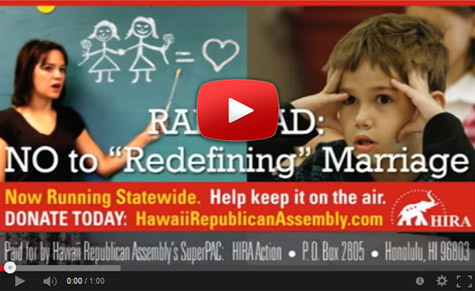 Click HERE for positive steps you can take today to protect marriage and protect our keiki! P.P.S. Please click "Forward email" near the bottom of this message in order to easily share this e-mail with friends and family, neighbors and co-workers.